If one takes two pieces of metal and makes them touch each other, they make an electrical connection. Or at least, that's what one expects. Reality may be more pesky though. In , Marcus Seifert discusses the problem that if you do not let any current flow through the contacts of a relay, or, equivalently, don't put any voltage on them, they become a lot less reliable. In most applications, one doesn't notice this because the relay is used to switch a sufficiently large voltage and current. But if one uses them e.g. in the preselector of a radio receiver, where only tiny HF signals are switched, this can be a real problem. The cause of this is that in the course of time (months/years) a thin layer of dirt accumulates on the contact, due to chemical reactions with gasses and vapours in the air. That layer can work as isolator, or even as a semi-conductor. If sufficient voltage is applied to the contact, it breaks down and the contact is restored. Because of this issue, good relays come not only with a specification of the highest allowed contact voltage and current, but also the minimal voltage and currents that are enough to ensure that the contact remains reliable. Typically this could be e.g. 1 mA and a few volts. Applying such a voltage to a relay in e.g. a preselector can easily be done via a few resistors. In  it is done in a nice way with some extra decoupling capacitors to prevent signals from leaking around the preselector filter via the power supply. The adjacent figure, copied from a reference book on this topic , illustrates how the contact is restored when voltage is applied. It shows the resistance (vertical axis) as a function of the applied voltage (horizontal axis), measured between two silver electrodes, one of which is covered by a layer of silver oxide, several tens of nm thick: that's just a few hundred atoms. The measurement starts at the top-left part of the graph: a low voltage is applied, which encounters a high resistance: more than 100 kΩ. When we increase the voltage, the resitance decreases slowly at first, until a voltage UF is reached, after which the resistance suddenly drops to about 10 ohm. That point is stable again, until the voltage is increased a bit more and the resistance drops to a fraction of an ohm. 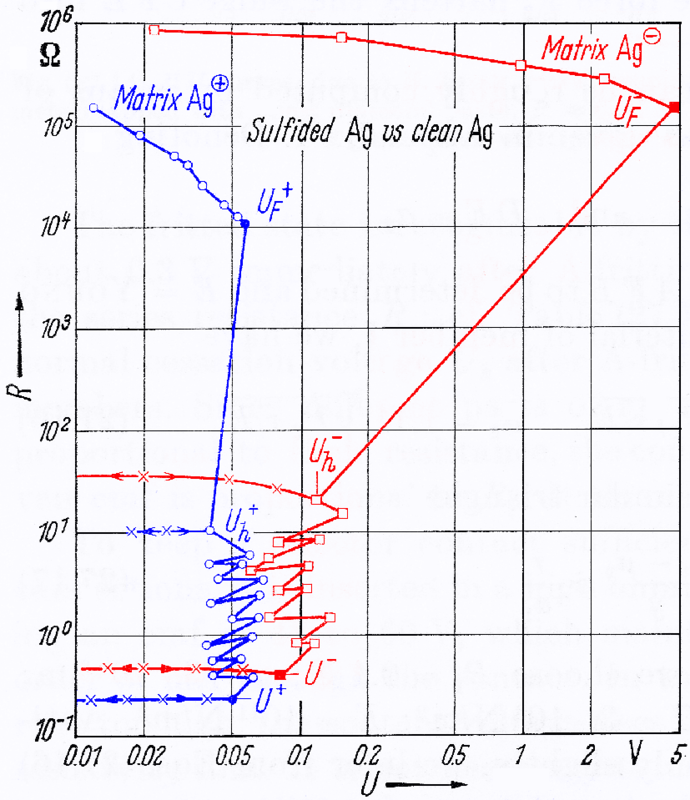 The difference between the red and the blue curve is the polarity: red for the silveroxide electrode being negative, blue the other way around. We see a large difference between both polarities: that's the semiconductor effect mentioned earlier. With other metals, one gets similar pictures, albeit usually with less polarity-dependence, which happens to be very large specifically in the case of silver. The voltage required to make the relay reliable, is called Frittspannung in German and wetting voltage in English. But also in the English-language literature  the sudden collapse of the resistance is called fritting. Some publications suggest that fritting also plays a role in the coherer, a detector used in the early days of radio. This is a glass tube filled with iron filings, which just barely don't make contact, but which do start to make contact when there's a radio signal. But this cannot be precisely the same effect as fritting, because typical circuits applied a constant DC voltage across the coherer; only the incoming RF AC voltage caused it to conduct. In contrast, fritting also works with DC voltage. Marcus Seifert: Vermeidung von Kontaktproblemen bei Relais in Preselektoren; Funkamateur 9/2017. Ragnar Holm: Electrical Contacts; 4th ed., 1967.